Hello dear ones! Who has a love for fine art photography for weddings but an equal love of color? While it's true that fine art generally skews neutral or very pastel, it doesn't have to. Fine art wedding photography can indeed be colorful and we're going to show you using juicy tones of grapefruit, tangerine, and lemon. Featured on Style Me Pretty. The simplest way to incorporate bright color into your day? Florals. Large blooms in bold colors easily carry the color story throughout your event. Not to mention your florist will adore you for choosing something different. And while beautiful silk ribbons are all the rage for bouquets (and let's be honest, hopefully here to stay), I chose to use a sash of chiffon on the bouquet instead for a twist. An extra wide sash adds a lush element to an already lush bouquet. Photo by Julie Paisley Photography. Florals by Petal and Pine. Styling by Feather + Oak. Hair and makeup by Leslie Ellis. Bright, citrus tones look gorgeous punctuated with white linens. Instead of the solid, banquet style linen I opted for vintage lace for it's textural beauty and feminine detail. 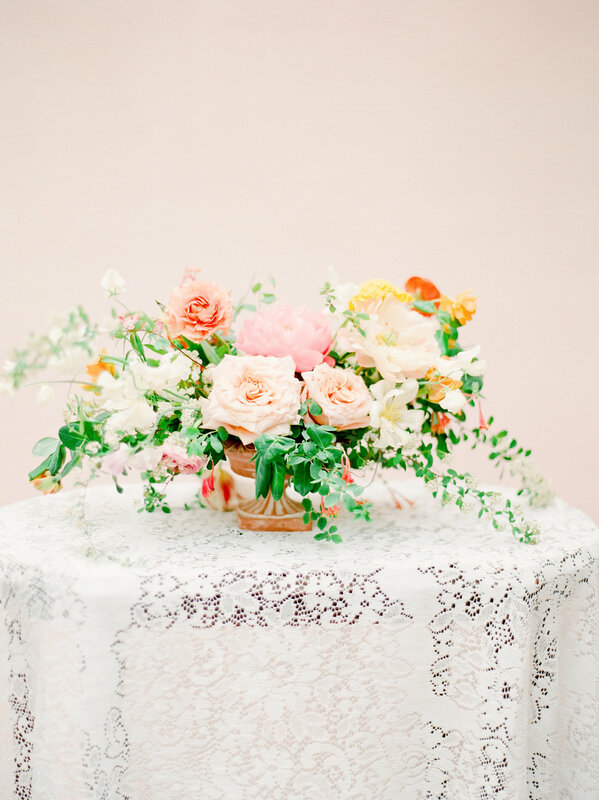 A beautiful floral arrangement paired with a lace overlay creates a beautiful welcome vignette at a wedding. Photo by Julie Paisley. 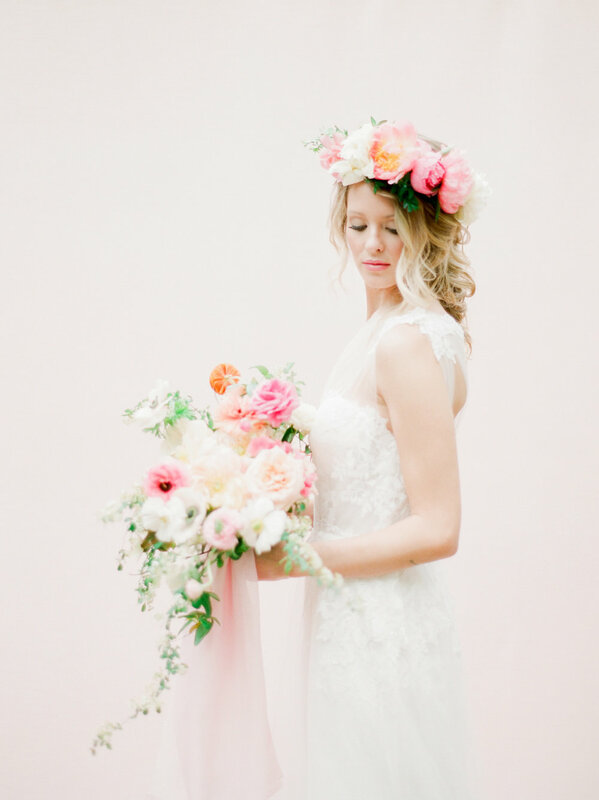 Exquisite florals by Petal and Pine. Styling by Feather + Oak. A beautiful, bold paper suite sets the tone for this wedding. This is the calling card for event expectations. There's no doubt you're going to see lovely color at a wedding when you receive this in the post. A colorful invitation is delightful to receive through the post while the table elements incorporate more white space to let the tablescape take center stage as a whole. Paper suite by Designs In Paper. Styling by Feather + Oak. Photo by Julie Paisley. When you have bright florals on the table, I prefer to keep place settings fairly neutral to let those blooms take center stage. Here I incorporated a blush goblet, a linen napkin in a juicy tone pulled from the bouquet, and a menu card that ties the paper suite to the table setting. 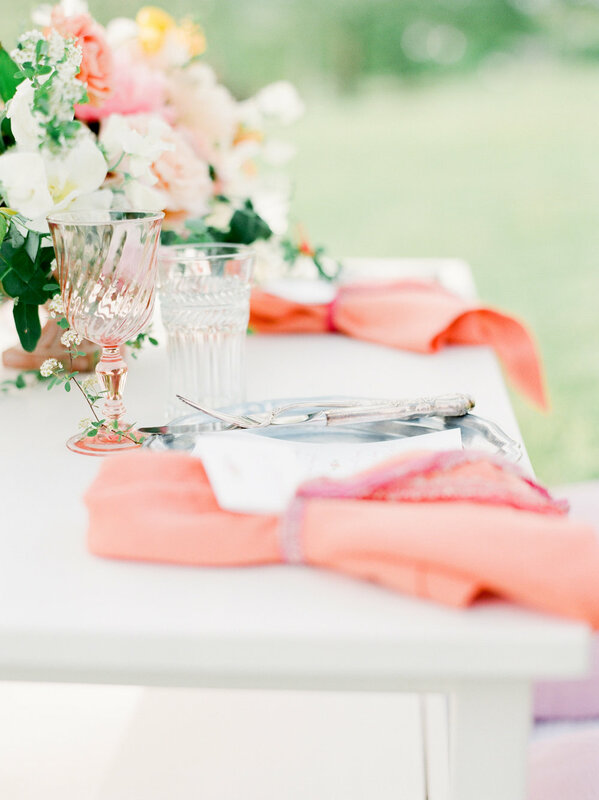 Blush goblet and a linen napkin in a juicy color brings the floral color to the neutral place settings. Paper goods by Designs In Paper. Styling by Feather + Oak. Photo by Julie Paisley. Florals by Petal and Pine. You can be a bride and wear color. Rosy gown by Hayley Paige. Photo by Julie Paisley. Florals by Petal and Pine. Styling by Feather + Oak. Hair and makeup by Leslie Ellis.